Sixteen new ionic liquids (ILs) with tetraethylammonium, 1-butyl-3-methylimidazolium, 3-methyl-1-octylimidazolium and tetrabutylphosphonium cations paired with 2-substituted 4,5-dicyanoimidazolate anions (substituent at C2 = methyl, trifluoromethyl, pentafluoroethyl, N,N′-dimethyl amino and nitro) have been synthesized and characterized by using differential scanning calorimetry (DSC), thermogravimetric analysis (TGA). The effects of cation and anion type and structure of the resulting ILs, including several room temperature ionic liquids (RTILs), are reflected in the crystallization, melting points and thermal decomposition of the ILs. ILs exhibited large liquid and crystallization ranges and formed glasses on cooling with glass transition temperatures in the range of -22 to -71°C. 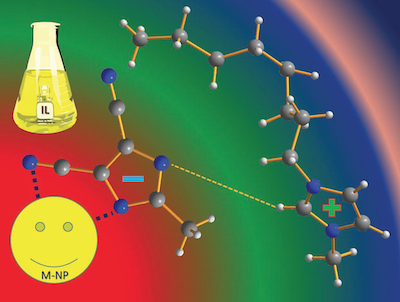 We selected one of the newly designed ILs due to its bigger size, compared to the common conventional IL anion and high electron-withdrawing nitrile group leads to an overall stabilization anion that may stabilize the metal nanoparticles. Stable and better separated iron and silver nanoparticles are obtained by the decomposition of corresponding Fe₂(CO)₉ and AgPF₆, respectively, under N₂-atmosphere in newly designed nitrile functionalized 4,5-dicyanoimidazolate anion based IL. Very small and uniform size for Fe-nanoparticles of about 1.8 ± 0.6 nm were achieved without any additional stabilizers or capping molecules. Comparatively bigger size of Ag-nanoparticles was obtained through the reduction of AgPF₆ by hydrogen gas. Additionally, the AgPF₆ precursor was decomposed under microwave irradiation (MWI), fabricating nut-in-shell-like, that is, core-separated-from-shell Ag-nano-structures.